Need a Painting Project Done in Nelson? | A&A Painting Ltd.
Everyone in the Kootenay area knows that Nelson City – the Queen City – in British Columbia, and one of the three cities in the West Kootenay region alongside Castlegar and Trail, is a bustling and growing commercial and population core area, and growing more progressively so. Even with Nelson’s primary reputation as a cultural, historical, and tourism centre, it naturally attracts businesses and additional residents to its present population, and this means more buildings and abodes going up. Nelson is experiencing a real-estate and business boom that started in the early 2000’s. It’s also booming agricultural and animal farm industry is seeing an increase in the number of organic farms, market gardens, food gardens, restaurants, cafes, coffee houses, local shops, art galleries, and even impromptu theatre venues. With all this infrastructure as well as the need to keep Nelson’s historic buildings well restored comes the need for painting jobs and painting projects. So, if you’re looking for the best painters in the Nelson area, you need not look further than A&A Painting Ltd.
No matter how big or small the painting project is in Nelson, A&A Painting is always ready to help you. Whether the painting project involves a residential home or any type of abode, commercial business, or light industrial, A&A Painting will offer the perfect solution to your needs. If your residential, commercial, or light industrial infrastructure is already existing and it just needs a fresh coat of paint, A&A Painting can be there for you as well. Whether you need the exterior or interior, or both, painted, A&A Painting has the professional team of experts and skilled at every interior or exterior residential, commercial, or light industrial painting project. They also have the right color experts who can guide you in making product and color selections for your specific needs. The team will makes sure the painting project finish will look exactly like what you have envisioned it in your mind. For all its interior painting work, A&A Painting now uses a containment and air filtration system in order to confine work zones. This is a fan and vacuum system that removes all VOC’s (Volatile Organic Compounds) and odors completely. This system is still used even if the customer selects no VOC paints. The system ensures that any interior painting project will have no negative health effects on the occupants and with minimal disruption. 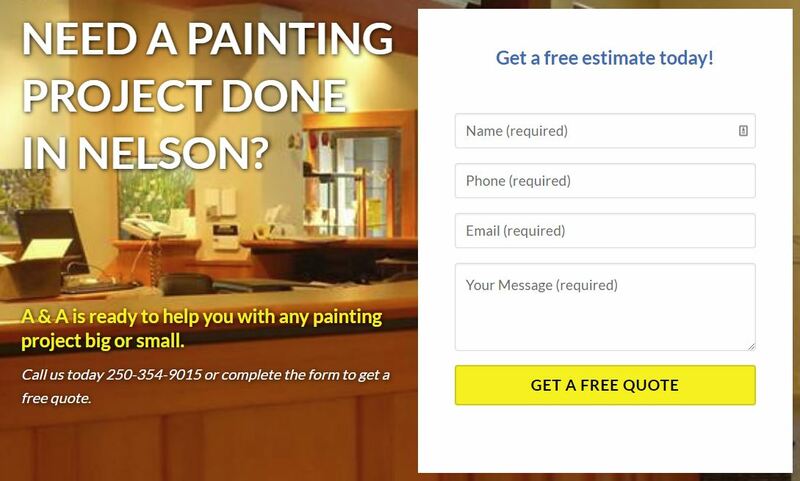 Need a Painting Project Done in Nelson? in Castlegar? or in Trail? Get a free estimate today!